I was sat glued to the television watching England’s desperate struggle in the semi-final of the football World Cup. I should have been in bed really and my mind was an absolute whirl as to whether I had remembered everything needed for a short notice lake-hopping trip over in France. With only five nights to visit three different lakes we would be pushing ourselves a little. Ourselves, being several members of the Free Spirit Fishing team, on a mission for filming different products being used and to hopefully film some footage for Dream Fishing Holidays about a couple of new venues they have taken on board. It was silly o’clock when I left my home on the Nottinghamshire/Derbyshire border on route to Earlswood, to pick up the main cameraman for the trip, Steve Coe. Steve is an outstanding angler in his own right and was to be fitting a bit of fishing in between the days of shooting, basing himself in my swim, but obviously on standby to get footage as and when required. The first issue occurred when I arrived at Steve’s house. He was supposed to have met up with Mark Hutchinson the day before so that Simeon Bond and Mark, who were travelling together, could reduce the load in my Discovery and take part of the rather bulky filming gear. We think we carry a lot as anglers, you want to see how much a cameraman carries! The meet hadn’t taken place and here we were without enough room to fit everything in. I took a bit of my gear out and eventually by forcing and leaning on doors we managed to fill my motor to absolute capacity. If I lived closer to Dover then I would probably choose to travel through the tunnel but, quite frankly, after several hours of driving along our British roads to reach Dover, I’m usually ready to stretch my legs and take advantage of a meal on board before starting the second leg of the journey, so choose the ferry, plus it’s cheaper of course. We were eating up the miles along the N4 with hardly any cars to worry about. It really is a pleasure driving the uncluttered and non-potholed roads after what we are used to putting up with in the UK. Our first port of call was rather an exciting one called Grand Pierre (it has been referred to in the past as Pierre 2 as well). The name comes from a venue I first fished in 2003 called Pierre la Treiche and was to prove to be an amazing venue that produced some incredible fish. I landed my first 50lb-plus there and I couldn’t help but marvel at the beautiful carp it held, so many of them wouldn’t have looked out of place in the Colne Valley. In fact the only carp picture I have up in my house is a stunning common I caught there which to my eyes is simply perfection. Daniel and Andre had developed an incredible place, thus it became the first French venue I actually visited three times (I like visiting new ones). To cut a long story short the fishing ended on Pierre La Treiche, so Daniel went looking for a replacement and this was where we were off to now, a larger water complete with an island. To be fair this venue has taken a lot more sorting than was expected due to the extremely wet winter we had last time around which prevented heavy plant from working to make the banks both comfortable and safe. Two years of hard labour have gone in to make it what it is today. It was hoped to be ready for the spring, but as I write this in July 2018 the first few guests have only just been invited to fish. The stock is still a bit of an unknown quantity, as there were carp present when Daniel took the place on, so it will be an exciting couple of years seeing how big these are. The carp that Daniel has introduced already makes the place rather attractive as it is, without thinking about the possible surprises. There are more fish lined up to go in as well. We never hesitated to say yes when Daniel asked if we would like to test fish it. Anyway, back to our road trip. Simeon Bond and Mark Hutchinson, Steve ‘Bardo’ Bardens and Trev Childs were in two of the motors and Nick Harvey had the luxury of travelling alone with lots of space in his Jeep. All had taken a much earlier tunnel crossing than the ferry I’d booked. I’m sure they waited to see what I booked then arranged to go much earlier. Good angling that! When we arrived, Bardo had a grin on his face for he had landed a 30-plus mirror moments before, so Steve had an immediate job with his cameras. We were in a rush to unload and set up before dark, so I started to unpack, whilst Steve got on with his filming work. Fish were already showing in front so I didn’t mess around with a marker rod wanting to start angling with the minimum of disturbance. 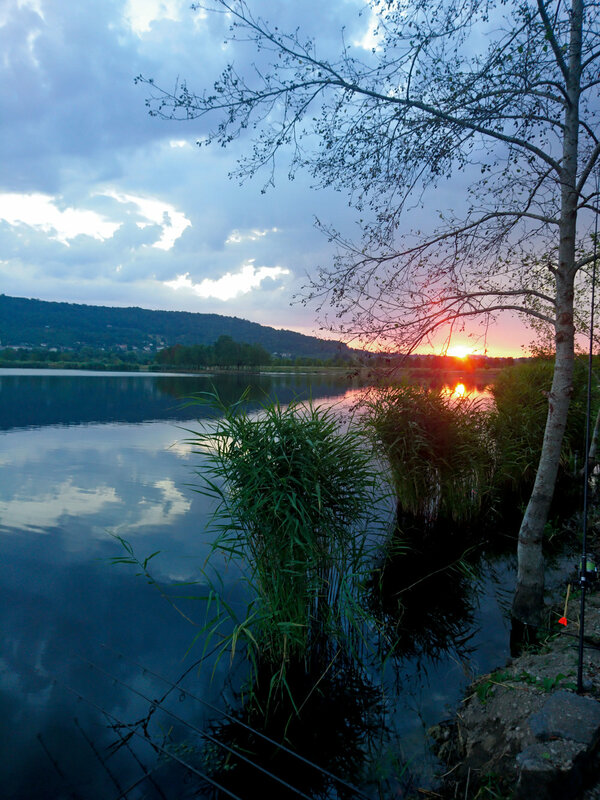 Simply relying upon stringers for the first night, with the full intention of watching and listening where the carp were out of choice rather than baiting an area and hoping they moved on to it. Although just casting stringers, they were to where fish were showing. One went down hard, and two with a dull thud. They would do for me. My hookbaits for that first night were the same as I would start with on most waters. A bottom bait straight out the bag on one, a wafter or snowman on another and a pop-up on the third. These were all my own Quest Baits Spicy Spirulina which has been an incredible warm-water bait this summer and with temperatures over 30ºC and the water feeling like bathwater, it was a no-brainer. My first take came to the bottom bait straight out the bag around midnight and soon I had the full ‘Lights, Camera, Action’ scenario unfolding at the back of my swim! Anyone who knows me will know I’m rather old fashioned and don’t use lights other than for an emergency. I know they scare carp, not all carp but enough of them for me to have learned over my 41 years of catching carp that I generally catch more when I avoid using them. Some carp are seemingly oblivious to a light shined upon them, but I’ll give an example how some really freak out. In the natural spring-fed pool of my garden I have carp along with roach, dace, gudgeon and sticklebacks. The fish keep the water coloured for most of the summer period due to them digging away at the bottom for the various natural food items they find crawling around. During the cooler periods the water clarity returns and by far the best way for me to check on my stock is to walk around it at night with a torch. Most of my fish are totally tolerant of this but three or four of them are petrified of the light and bolt immediately. Now the problem with this is that the ones bolting and sending out panic signals completely freak out those that are usually unconcerned by the light and they too get as far away as they can. So, I take and accept, that not all the carp are spooked by light, but some most definitely are and that carp I hooked on my first night at Grand Pierre most definitely gave me a much bigger run around than it really should have. With Simeon Bond, Mark Hutchinson and Steve in my swim the talk soon moved onto the 70lb-plus common that’s in there as the fight just went on and on, with my beloved 12ft 6 inch 3 ¼ lb Hi ‘S’ rods and 25 year old SS3000s really being tested. I did keep thinking about my small size 8 hook. I don’t know why though, as I have had loads of big fish on that same pattern. They just dig deep and stay in place. Eventually Hutch was paddling bare foot in the dark to net my prize. It wasn’t the fish we had all been talking about but who am I to complain – I’d just had one hell of an exciting fight, with my mind conjuring up all sorts of monster carp images. It was a beast anyway. As we were at Grand Pierre to primarily try and capture film footage we had purposely set up in a line. Not perfect from an angling point of view, but far better suited to filming with not having to lug heavy cameras around a lake. So, from left to right along the south bank towards the facilities were Nick Harvey in the corner with a lovely wind pushing into him; next along were Bardo and Trev, who were doubled up together; then myself and Steve Coe (main cameraman) and, finally, Simeon Bond and Mark Hutchinson, who were doubled up on the end. We each armed ourselves with mini cameras to capture any action immediately before one of the main cameras could get in situ. Waking somewhere new is one of the many joys in life, or at least for me it is. In fact it’s a result actually waking at all with the health issue I have. I forced myself out of bed to sit and watch the water. I’d not bothered with any sort of shelter so the morning dew had coated everything but would soon be evaporating. Up in the next swim I noticed the steam rising from Bardo’s kettle. It seemed the perfect time to take my mug for a walk and save waking Steve with my clanking around of spoons, cups and kettles. That’s my excuse anyway. We sat watching the world come to life, when suddenly Trev was into a fish. Quickly I rushed back to wake Steven to get the big camera rolling, so missing the fight of Trev’s first fish but managed to get a second brew out of Bardo whilst watching Trev posing in front of the camera with a 40lb-plus mirror, which was soon added to with a 45lb common. We had been on the pit for just 15 hours and already we had four big fish captured on film. Si and Hutch were still to receive action so it seemed they had no fish in the area that first day. I found it interesting that despite the incredibly hot conditions most of the shows we were seeing were on the other side of the lake, out of the wind. Three other English anglers who were also guests of Daniel were over there. During the day Steve Coe had wound his rods in so he could concentrate fully on filming. Before he had wound in though he had made sure there was a good bed of his Dynamite bait out there for him. I have a friend who will rest his swim for 10 hour periods and he is so successful. The carp’s confidence is gained, the water colours up as they feed and, eventually, when he casts back out, he has the ideal scenario. Coloured water and fish that have started to feed, got away with it and will want more or be back for more if they have drifted off. So with the filming work completed for the day Steve was free to drop all three of his hookbaits really close together, over that pre-baited spot. The following morning it was Steve’s turn and while he was stuck into his first French carp the roles were reversed and I filmed him. Eventually, a lovely scaly mirror could be seen in the clear water. The carp was floundering on the surface beaten, when the hook just popped out. I really felt for Steve, he had worked hard with the cameras and finally his time to fish had come and the carp gods had kicked him in the teeth. I talked him out of recasting the rod he had lost the fish on as he had all three tight on the same spot, so two other rods were still fishing effectively without risking crashing another lead back in. Sure enough, rod number two was soon away and his first French carp lay on the mat. I was made up for him and it was great to hear his comment that he didn’t expect them to look as English as they do. Grande Pierre is a sensibly-stocked big fish water, you can see that just by its clarity, so the fish have lovely dark colours. If he was not chuffed enough with that common, then shortly after, the final rod on the spot went and a much larger fish was hooked. A deep-bodied mirror sporting some rather impressive scales could be seen twisting around, determined not to come any closer. The hook hold was fine though and Steve’s first ‘proper French chunk’, as he put it, was soon being held aloft for the cameras. I don’t think the smile left his face after that. During this scrap Trev had helped himself to yet another mid-40. What a venue it was proving to be and what an incredible average size of fish too – all of different strains, which I like in a fishery. We had a social for our final night and were totally spoiled by Daniel and Andre, along with a couple of helpers who, I am ashamed to admit, I never caught the names of properly. My hearing is that of someone my age these days! Several courses were served as different bowls and trays were brought from the substantial kitchen and all washed down with beer and red wine. Everyone departed back to their swims as the light started to drop. I never cast back out that night as I ended up in a meeting which continued into the next day. It seemed that the fish had avoided Bardo’s spot after the first capture, so just before our social he had moved from the south bank to the west bank we had lined up along, and instantly got stuck into a very big fish. Sadly though, one of the three anglers on the north bank opposite us had baitboated one out long and Bardo’s fish picked up the line, whereupon a tug of war ensued which eventually led to him losing his fish. His luck had been in so much, what with the instant takes in both swims on his Nashbaits, but this time there was a loss which he could do little about. On Sunday morning, whilst we were packing up, and after a second entanglement which had ended with another fish wrestled off him, Bardo finally landed a gorgeous long dark common. Conclusion... Seven anglers sitting in a row, with three of the swims being shared, is far from ideal but a necessary evil of what we were hoping to do. The average size of the fish is already impressive, with still more due to go in. Daniel has stated that there will be no carp of less than 35lb put in to supplement the existing stock. 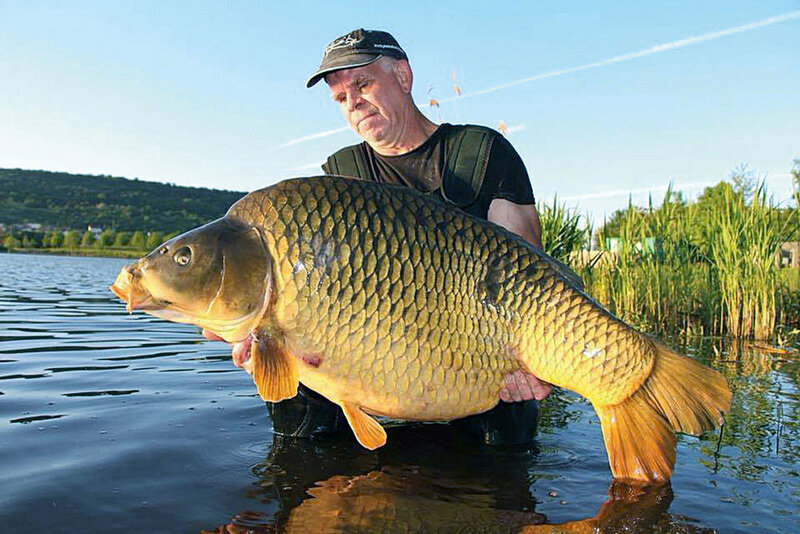 Nobody is quite sure how big the existing fish are but the pictures of a 71lb common taken this year are enough to whet the appetite of most people. The facilities already there are more than enough, with a fully-fitted kitchen where the full catering package meals are freshly prepared. There are also showers and flushing toilets, as you would expect. We visited early with the work still ongoing but were more than impressed with what we saw. There are two different eating/sitting areas for those who wish to eat away from their swims and quite an amazing barbequing area. This, along with the fridges, freezers and battery recharging areas and I really struggle to see the angler wanting for much else, although there are more plans for development as time goes on. The lake is extremely secure being locked at all times unless you need to get out to sightsee or go on a simple shop run. There is a town very close by, literally a few minutes’ drive from the lake. I was really pleasantly surprised when we arrived there as the lake is already mature – I was picking and eating fruit for breakfast one morning (sorry Daniel). I had only seen winter work party pictures up until arriving and what confronted me was lush vegetation. Would I go again? You bet I will! Grand Pierre is up there with the big carp holiday venues already and still has uncaught fish to be had. So with a successful Friday and Saturday filming mission completed at Grand Pierre, the seven of us pointed the convoy back towards Calais for the next stop which would be Roe Deer Lake. Two 4x4s and two pimped-out vans jostled each other weaving in and out of the French traffic whilst trying to keep together. Roe Deer Lake is only a couple of hours from Calais, so a perfect venue for those first dipping their toes into French angling. Again, I had never been to this venue before, despite reading about it for years. Upon arrival we were met by Hugues, the lake owner, and soon we were stood outside some of the best facilities I have seen at a French carp lake. Our group was to split up – Simeon Bond and Mark Hutchinson had only managed to escape normal life for a long week-end so had to be off. Bardo and Trev were staying for just the night and had to be away the next morning, which left Steve, Nick and myself to do two nights. The reason Si and Hutch had stopped off was to take a look at RD2 which has been under development for some time now but was not yet open. With the afternoon cracking on I suggested to the lads to slot themselves in wherever they fancied and I would take what was left, as Si had asked for me to take a look around RD2 with them. A few fish were spotted cruising along whilst we silently crept along the bank, which looked to be a stalker’s paradise. As we rounded a bend where the water opened out I stopped dead in my tracks. There, in front of me, was a really solid-looking fish, well over 50lb. “Look at that, that’s way over 50”! We all froze and, unbelievably, the carp swam to us and flaunted its body giving us a clear view of every side and angle. “That’s more like 60-plus you know...” were the next words I heard, I couldn’t argue with that. “Can I fish here tonight?” I asked, with pleading, sorrowful ‘puppy dog’ eyes. But it got me nowhere. I was here to hopefully catch and get footage from Roe Deer and it was quickly pointed out to me that Roe Deer has commons to over 60 in it anyway. Now if that first big fish wasn’t impressive enough, soon we were looking at another with equal proportions. When the two fish joined up together it made a sight that I’ll never forget. Si and Hutch were cutting it a little fine to get back for their booked tunnel crossing and France were about to kick off in the World Cup Final. Hugues had friends over to watch it and was itching to get back, so soon we were back at the motors. I almost forgot, due to the two big fish flaunting themselves, that we also stumbled across many other mere 30s and 40s. Any one of those would have made my day but they did look small at the side of the ‘special ones’. These fish have never been fished for. When this venue finally opens there will be some incredible, immaculate, big carp landed. Hugues went in to join his friends and I went off on my first lap of Roe Deer. Naturally my first choices of swim were taken but upon walking into number eight I stopped in my tracks. A decent looking fish was heading straight into the bank. It was coming straight toward me just like the big fish had in RD2. I smiled to myself and the silly thought crossed my mind that perhaps I had turned into a carp magnet drawing them to me. That fish continued to come and amazingly started to feed at my feet. It was clearly 40lb-plus and stayed there oblivious to me. Its tail twisted whilst balancing itself – it appeared to not have a care in the world. I never bothered to look any further; the swim was the furthest away from anyone else I could get and was large enough for Steve to slot into, which would make filming so much easier. We still had a long list to get through and only really one day to do it as we had to be packing away on Tuesday morning, ready for our journey back. By doubling up again, it would mean that Steve could fish right through and we could both take to the camera should the other catch. So, to the distant cheer of goals being scored and far off horns sounding, I started to set up. After seeing several carp in the edge while walking around, plus the one that had come right in to say hello, I had decided to fish my three rods in the edge to keep as much line out of the way as possible. I had suggested Steve do this but with an island on his side, he very much wanted to fish to it. I didn’t push it and left him to do his thing. I was basically in a corner taking the left-hand side of the swim so I dropped one bait in my nearside margin less than a rod length out and cast two over to the margin of the left-hand bank where there wasn’t a swim. This allowed nice easy baiting of all three rods. I’d adopted two different baiting approaches. My left-hand rod I fed with just three handfuls of my Quest Baits Spicy Spirulina and a couple of handfuls of Chilli Rahja Hemp. Despite the fact that I could have baited this really tight, I preferred not to, and had spread it over a 6ft area. The other two rods I baited loosely with the catapult, firing a kilo of 10mm and a kilo of 15mm baits over the top of both hookbaits – one of which was a 10mm and the other a 15mm, which were probably around 25-30ft apart. I also spread a long, thin line of boilies between the two, as it was obvious by the coloured water that Roe Deer held a lot more fish than where we had come from. I didn’t want a tight baiting pattern risking each hooked fish from spooking anything else that may have been feeding. Steve adopted a totally different approach and baited with pellet, with just a few boilies scattered in. Light was dropping fast as I finally had everything sorted and, having gone all day without food, I was desperate to cook something to eat. The chilli went down really well as we sat and chatted, with the distant drone of continuous horns and sirens from the French celebrating their World Cup victory in the background. During the following day we were able to appreciate just how quiet Roe Deer actually is, with absolute peace and tranquillity away from busy roads. By the morning I had caught on all my rods more than once. The fish the first night ranged between 19-25lb and boy did they go! Each one of them had me convinced I was into much larger carp, but with the soft Free Spirit E.S’s I was using, I had no concerns about hook pulls. When Steve saw me hook another from under my rod tip and I pointed a fish out to him down his right-hand margin, he finally pulled off his island spot and dropped a bag down the side. Minutes later his rod was dragged off the alarm and he was in business. I wish I’d not pushed him into fishing the margins now as from that moment on he seemed to take over on the catching stakes. His bait and rigs which had produced nothing out in the lake could easily have been dismissed as being no good. There was nothing wrong other than location. I had found it interesting the previous evening watching how each angler had set up and where they had cast. I never mentioned but Bardo had been first off the mark and had used observation and stealth and had simply lowered a bait in, right in the edge. I was keen to try and catch my first French carp off the surface. Not wanting to mess the main swim up I moved up several and started to flick some Mini Mixers in. A couple of fish started to feed on them but I bided my time, waiting for a few more and the ideal competitive feeding scenario to set in. A few more did feed but were very delicate feeders and never once did I see aggressive feeding. There were plenty eating the freebies but all were so gentle and none rushed. Eventually, I cast out a cut down fluoro pop-up for the benefit of the film camera being able to pick it up and cast. Several fish mouthed my bait but never took it completely in their mouths. I had to wait a long while for my first proper take and pulled it straight out of its mouth. Somehow or other I managed to do this three more times before having to leave a swim full of feeding fish because we needed to drive over to RD2 to film parts of the lake. So, I’m still a French surface-catching virgin. There was a bit more ripple on RD2 when we got there, making visibility a bit more difficult than the previous day, but we did find a group of fish. Sadly, the two big ones of the previous day weren’t to be seen. There is only so much you can do in a day so it was back to Roe Deer to prepare for the final night. As we drove by Nick, he was preparing his unhooking mat and he looked up with a great smile across his face. “How big?” I blurted out. The three of us peered into the net and all agreed it looked a 40. Up on the mat it looked huge and Steve commented upon the size of its fins. It was an absolutely cracking-looking carp and a great reward for Nick’s patience and perseverance on the previous lake. He’d had a flurry of fish that afternoon. I saw little point in changing what I’d done the previous evening so once again repeated the same, and that final night was a repeat performance for me although I ended up not recasting in the dark after they had gone. My last rod went at 3am and I really did need to think about getting some sleep for the journey home which would involve almost twice as long driving in England as we would be in France. When I rose from my bed I repositioned the baits but didn’t re-bait. Perhaps this was a mistake as although I caught a couple more fish I felt there were a few there. Steve, on the other hand, with his new found margin fishing skills was enjoying some pretty hectic sport with fish to 31lb, before we had to finally agree to wind in and pack up in order to not miss our ferry. Roe Deer is an amazing venue and the fish are in terrific physical condition, with lots of them. With carp running to over 60lb it is rather unique for those who want lots of action but also the chance of a real big fish, with the added bonus that you don’t need to be able to cast to the horizon to catch them. We weren’t there long enough to take full advantage of the facilities but they were alongside the best I’ve seen on a fishery. Toilets in two places and an independent shower, urinal and wash area. The main cabin is huge and has everything you would find in a normal kitchen, including utensils, a large kitchen table, extra freezers, microwaves, a television in front of the main sitting area (which has comfortable sofas), an electronic dart board and so on. What is best of all, it is only two hours into France. Will I be back? Yes definitely. I have an unsettled score to settle with those pesky, surface-feeding carp.